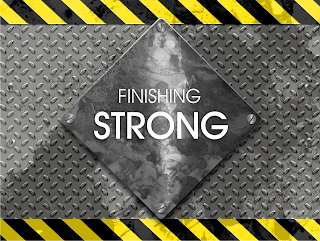 Some quiet thoughts : Reflections: Will it be a strong finish? Will it be a strong finish? We recently acquired a book on which this blog is based. This book was recommended by a good friend who has seen a lot of life and experienced a great deal more. This book has challenged, provoked and encouraged me keep going on the straight and narrow because it opens up to true healthy joyous living and indeed to finally finishing strong. We have all seen flash in the pans, the ones who make a big noise, know how to attract and play to an audience, to focus on the external and on what is seen rather than on the eternal, that which is not seen. We all know of one or two great men of God who suddenly shot to fame and suddenly got shot down by something or someone. I have summarized a few points from a chapter this book that I have being reflecting upon. But what is the title of this book? Well, it is aptly titled “Finishing Strong” by Steve Farrar. I would strongly recommend you make a wise investment of buying this super book. To finish strong we need to survive the ambushes that life throws at us in various forms. Getting through the ambushes is what separates the boys from the men. The men are aware and prepare for the ambushes. And might I add – power? In my life experience I have seen many being ambushed by this deadly one and the root of which I feel is selfish ambition and pride. There are four simple questions we need to ask ourselves and answer ruthlessly honestly. All of the great men who fell tripped up on one of the 4 mentioned below. Frighteningly sobering. 1 wrong answer- risk, 2 wrong answers – moderate risk, 3 – bad risk, 4 – dead meat. The author recommends you get help quickly and treat this as urgent. Ananias and Saphira were more interested in looking good than doing good. Do you think it was the first time they lied about money. Are you shooting straight when it comes to money? Qualifications for having a public ministry is not giftedness - Qualifications for ministry is proven character. A gifted man is not necessarily mature. In fact the very “giftedness” can be his down fall because he does not to work hard at discipline. That’s why they lag behind in character. The great commission and family are not in conflict with one another. The Great commission is about making disciples and the first ones are in your own home. Our kids don’t need more things- they need us. I think there is a lot of matter to reflect upon and work on in this brief summary of but one chapter in this great book. I am putting some things that my heart has been convicted of into practice. Will you join me?